This is my official November 2015 Net Worth Update. 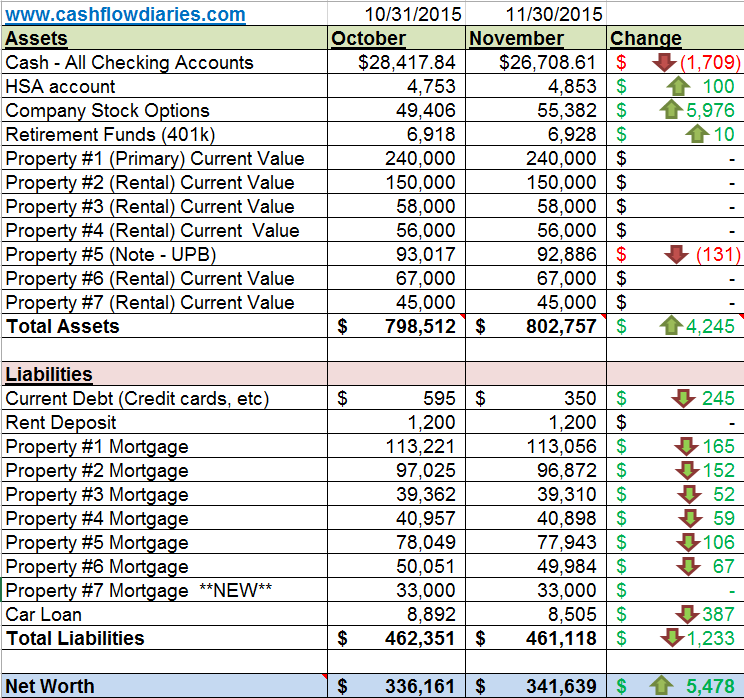 Below are my actual numbers for ALL my investments and liabilities as of 11/30/2015. Explanations and quick summary below chart. If you would like to see my previous months net worth posts, please visit my Net Worth Tracker. As you can see in my chart above, my net worth increased by $5400. Not too shabby. So out of the 7 months I have been documenting my net worth, I have only had one negative month and it was that black Monday month (August) when the stocks crashed for a day. Since then, I have been consistently increasing my net worth which is great. It would be awesome if I could get a big boost next month and put me at an even 350k for the year. I’ll keep my fingers crossed. Okay so let me tell you a little bit about my month of November. I went on a wine tour in Fredericksburg, TX which was super cool. It was basically 8 hours of drinking wine. Not my best moment but we had a great time as we went along with a few other friends we know. (My GF and I). I had a $190 repair bill for one of my rental properties also which was out of the ordinary as you can see in my Passive Income Report for November. My GF and I also booked another trip for next month. That is right folks, more vacation time for me!! Haha, I really do love taking vacation and although it puts a nice dent on my cash as you will read below. I think it is worth it for me. The experiences and joy it brings is priceless. So next month I will be going to New Orleans to celebrate New Year’s and I am really looking forward to this one. I have been to New Orleans a bunch of times already but it was always with big groups of friends and all we did was get hammered on Bourbon Street. This time it will just be a nice romantic getaway for two in which we will get the chance to see other parts of the city and explore new things other than drinking alcohol on Bourbon St. I will let you know all about it when we get back. I also had the chance to spend more time with the turnkey providers who I purchased turnkey #1 and #3 from. They flew in, contacted me and we had a good night out in the town. Not only did we have a blast hanging out together but they also got me a Christmas gift which was really surprising. 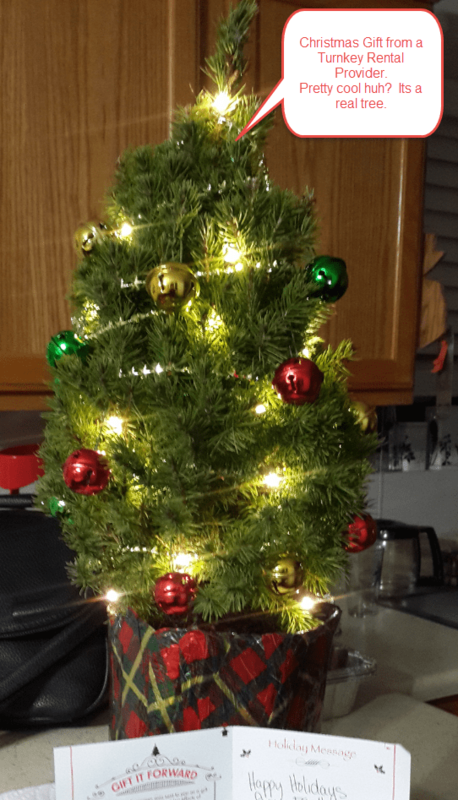 They got me an actual mini Christmas tree. It’s a real tree and it came with lights and ornaments. I thought that was really nice and cool of them and after the holidays I will plant the tree in my back yard somewhere. The picture on the right is of the mini Christmas tree they gave me. Now what other turnkey providers do you know that buy you gifts and go out to dinner and fun with you when they fly into town? Not many I must say. They are really buttering me up and I will definitely be leaning on them for my next turnkey rental property purchase. I’m hoping that in February I will be ready to purchase again. Although you can’t tell by looking at the Personal Capital chart at the bottom of this post. I did take quite a hit on my cash position. It’s definitely not normal for me to go negative on my cash unless I am buying a new rental property but I spent a lot of money in November for booking vacation and just other items I purchased through out the month. December might be a bad one for me also with cash due to the New Orleans trip and not to mention Christmas coming up. I am actually going to try to cut back heavy on xmas gifts this year so hopefully I will save a good amount of money from that. We will see so keep an eye out for net worth update next month to see in which direction it goes. My cash as noted above in the spreadsheet consists of two different checking accounts. My normal checking account and my REI (Real Estate Investing) checking account. Not Satisfied! My HSA deductible is $1300 for the year and I have close to $5k in this account so with that being said I am only taking a very small amount out from my dreadful day job paycheck to fund this account. Any money after that deductible will just sit in that account not making me money. I know I can use the money that I don’t put in there to get better returns as long as I invest it in more real estate. This number should increase each month a tiny bit. Satisfied! Ahh what a beautiful feeling it is when you see your stocks go up isn’t it? I was very happy to see my stock options take a significant increase this past month. They are still not up to the level as they were before August but they are getting there and I will keep my fingers crossed it continues to go up. These are stock options from my day job. I am fully vested. I am not planning on selling this stock and will just hold it for the long haul so whether it goes up or down it is not really affecting my life. It is pretty much only affecting my net worth updates. Very Satisfied! A measly $10 increase to my crappy 401k. Boohoo! It’s not really a big deal because I do not contribute any money in this account. I made an executive decision awhile back to take money out of my 401k and no longer contribute any more money to it. Mainly because I do not get matched contributions from the dreadful day job. But also because I KNOW I can make better returns using that money on rental properties. I really don’t like the idea of having an account that punishes me to take money out because of age. Satisfied! Rent paid on time. Had a fence repair of $190 for the month of November. This repair put a little dent in my passive income but its okay. I will always have money to put back into my properties and im okay with having to pay this. This is my first rental property. It used to be my primary residence. I expect gradual appreciation from this property as well because it is in the suburbs of this HOT market I live in. Love me some HOT markets! 150K is about what its worth now based on MLS comparisons. I will update the market value of this property in early 2016. Super Satisfied! Rent paid on time. No issues or repairs for the month of October. I was however contacted by my property manager and was told they are making some changes to the company and how they do business. The changes were all positive and they hired some additional staff. This my 2nd turnkey rental property. I do not expect much appreciation on this property. I purchased this for CASH FLOW purposes only. Satisfied! I got November rent paid on time. This tenant however reported a break in to the detached garage on this property back in October but I have not had to pay the repair bill for this yet. Will probably do so here in December. It will cost me anywhere from $100 to $200 to repair the damages. This is my 3rd turnkey rental property, I purchased it in early June 2015 and I absolutely love this house. I do not expect much appreciation on this property. I purchased this for CASH FLOW purposes only. Satisfied! This is my most recent turnkey rental property, I just bought this in late October. The first month’s rent has been paid on time. Obviously no issues or repairs on this one as it is brand spanking new. I purchased this property also for CASH FLOW purposes only. I am not expecting appreciation gains on this one. Satisfied! Looks like a good month Alex. Enjoy the Trip to New Orleans. I don’t mind spending cash on experiences. Just crunched our numbers and it was a pretty normal month for us too. Thanks Brian, I am definitely pleased with the November net worth increase. Glad to hear your month was normal as well. Dang dude! you’re killing it! My brokerage account took a hit the last few days, and that’s something to be said about stocks vs. real estate– control. 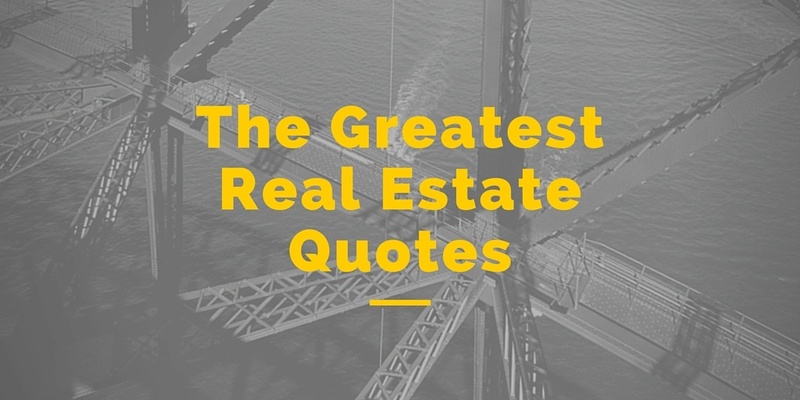 There’s more control over real estate, although it’s not total. 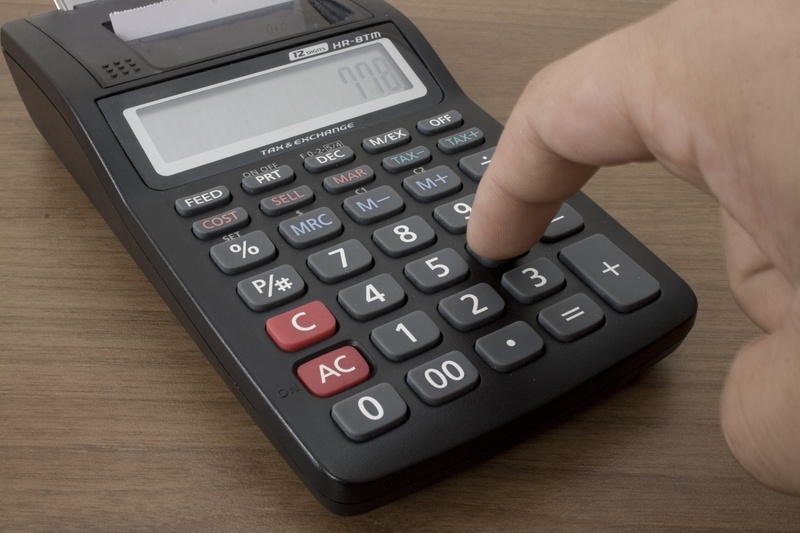 A tenant may not pay here and there, and repairs creep in once in a while, but if you/property manager screen them well, and you have plenty of reserves, then you should do okay. I plan to keep these equities a long time, and have been building up my portfolio… but I’ll be honest with you; it does hurt when you see those red numbers in your Scottrade account! I kind of want to buy more stock/real estate, but I think I’ll pay down some debt first. Congratulations on the new/higher net worth. That is certainly motivating. Thanks JM! Im sorry to hear your brokerage account took a hit the last few days. That is a bummer! I do agree with you though that real estate has a lot more control. I mean the fact that a media speculation or news story can determine what happens in the markets just boggles my mind. I definitely agree with you that you should pay down your debt first before buying more unless the rate on your debt is super low. I appreciate the feedback on the net worth growth! Hopefully it will continue upward. If it wasnt for my steady day job pay check I definitely would be able to grow like I am so I am very grateful for that. The stock options of course were a great bonus. I got lucky to work for a company that offers that. When I first started working there, there were no options or even any stock at all. This is awesome! I love how many properties you have. I have 1 home that is a rental and I’m quite pleased with it. I purchase a home warranty on it each year and it has paid off. I’ve definitely gotten my money back as I’ve had the dishwasher replaced and the A/C unit, which would have been a HUGE cost for me. I would love to own another rental and have it be an AirBnB, as I think I could get more bang for my buck than a traditional rental. Great job!! Thanks kristin! I didnt know you had a rental, that is great to hear! I have always wanted to do an AirBnB rental also and just might in the future. We’ll see. Hey man, finally caught up, have read all of your posts now ;)..
Great month for you here and is there ever a time you’re not on holidays haha! Jef! You are the man!! Im really happy to hear you have read all my posts, its like you know me now! haha. I guarantee you that if I ever go to AUS, you will be the first to know! Thanks for the offer! Awesome thanks it was my pleasure and yes I feel like I know you reasonably well haha.. Your detailed outline of your net worth is really inspiring! It makes such a difference to keep track of your income and expenses so intricately…there’s nothing better than seeing it pay off! Hi Jessica! Thanks so much. It really does make a big impact keeping track like this. It makes me spend less on junk and more on assets! I’m not going to lie… Anything to do with finances is like Greek to me. But, I do understand that in the end you are improving. Good for you! I’m not going to lie…anything financial is like Greek to me. In the end, I do understand that you are improving! Great job! Haha! Thanks Alison, i have definitely been improving and hope to continue in that path. Sounds like you are on track for a great year! Thanks Heidi! 2015 was very good to me and I am hoping 2016 is even better! Go you! My December is looking the same 🙂 the end of the year always brings expenses plus gift buying. And this year a vacation. It’s all about planning though right? 🙂 looking forward to checking out the rest of your blog! Ha Thanks Christie!! December is a tricky month but because of planning like you said, I think I will come out ahead. Thanks for checking out the blog. I appreciate it! 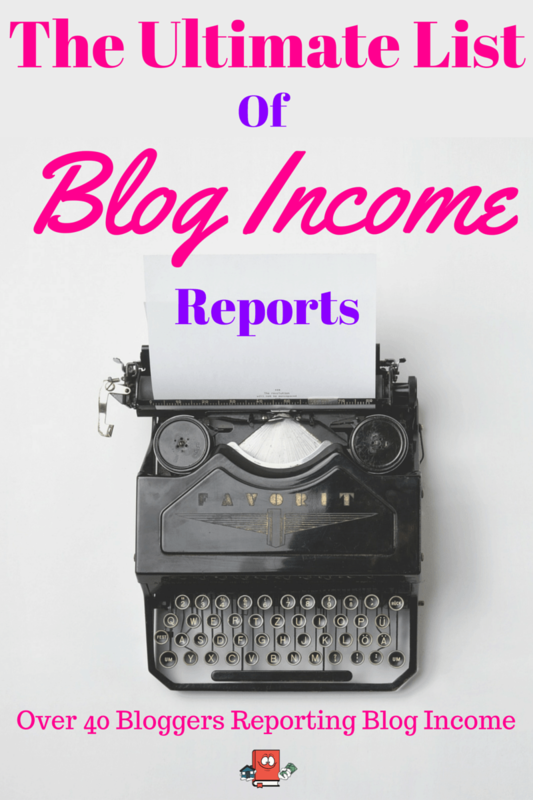 I could really benefit from following your blog. A wealth of information. Looks like you’ve had a great month Alex! Wow I wasn’t aware that you’d bought a 7th property. Looking forward to reading more about your advice in your success. Subscribing today to your blog. Keep up the great work! Thanks so much! Yep I bought the 7th one about a month ago. Its been great! Thanks for subscribing, I appreciate it. Great spreadsheet. You are definitely well organized. Looks like your going to have a great time on New Years Eve too. I am a little OCD when it comes to organization but it helps a lot to keep track if finances and budgeting and stuff. I am leaving for NOLA tomorrow and im super excited about it. Thanks so much! I’m so happy for your progress, Alex! If I were you, I would diversify a little more by putting some money in 401k to buy some low-risk index fund; furthermore, 401k is tax deferred. Just my 2 cents. Hey Annie! Ugh i am really anti 401k because my company does not match anything and I really do not like the idea of assessing a penalty to use my own money. I am going to be retiring way earlier then “retirement age” based on 401ks or society in general so I would rather put my money somewhere where I can take it out whenever. I do hear you though trust me, its a great thing to use a 401k and take advantage of tax deferrals but I just don’t think its right for me at this time in my life.